Choosing hope. And then working for it. I have two choices, looking at how the Scottish referendum went: to look at the 55% of the voters who rejected the uncertainty of independence for the certainty of more Westminster policies. Policies which have given Scotland food banks; closed shipyards, quarries and paper-mills; illegal wars; austerity and bankers’ bonuses as an answer to financial meltdowns. Or to look at the 45% who trusted Scotland to take her fate in her own hands and risk the difficulties and rewards of independence. To find, befriend and work with that percentage of the 55% who voted for the union, not out of fear, but because they trust that union as much as I trust us to be able to thrive independently. To understand that we all love Scotland, and wish her the best, we just disagree on how to win it for her. Focusing on the 55% debilitates me. But looking at it in this second way gives me hope, it’s a much more positive vote counting method. So, for the same reasons I voted for independence – because I’m not built to choose heartbreak and pessimism as my guiding emotions, I am built to choose hope, that very emotion Better Together derided – I accept that Scotland will remain in the UK, at least for the next generation. I accept that the majority wins, and hope it will be a win for all of us. But because hopeful people can also be realistic people – unlike how some in Better Together described us – I know that we’ll have our work cut out to make sure this ‘win’ is a win for us all, and doesn’t make towns like my own lose even more that they already have. So, it’s back to work for me and those on either side who must or can choose hope. And our first hopeful task, after accepting and respecting the majority choice, and reaching out to those who voted differently to us, must be to hold the winners to the promises which helped them earn their win. Whichever way you voted yesterday, you voted because you thought your vote counted. So make it count. Make your voice heard. 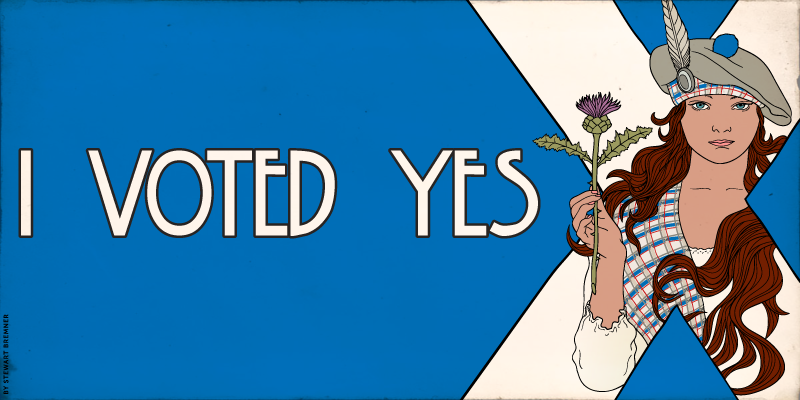 Make your love of Scotland into a force for her betterment, for a real win for all who live and work here. Choose hope. But let’s make sure it’s not blind faith: make them keep their promises.